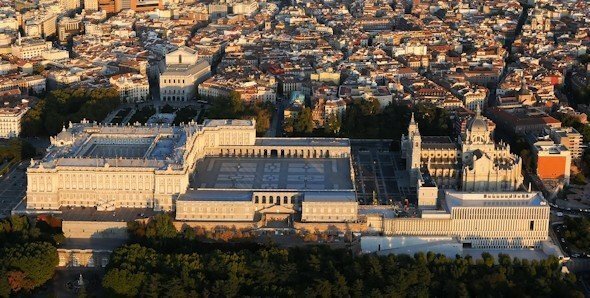 The Royal Palace in Madrid is the official residence of the King of Spain, but its use is restricted to state ceremonies. 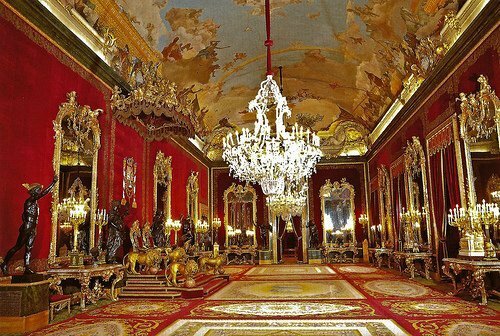 This is one of the biggest palaces in Western Europe because it has 135,000 m2 and 3,418 rooms. It houses a precious historic and artistic heritage. Its origins date back to the IX century, when the Muslim kingdom of Toledo built a defensive structure that was then used by the kings of Castile and replaced in the XVI century by the ancient Alcazar. Its architecture imitates the French style, while respecting the Italian proportions. Its splendor and beauty are highlighted by the wonderful gardens that surround it: the Sabatini Gardens north and the Campo del Moro south. Its decoration is magnificent: its vaults are covered with paintings from the greatest artists from different periods: Goya, Velázquez, El Greco, Rubens, Tiepolo, Mengs, Caravaggio, Vicente López. The palace also has a few historically important royal collections, like Armería Real's, which shows weapons and armour dating back to the XIII century and beyond. Besides, it houses the largest world collection of Stradivarius and unique collections of tapestries, porcelains, furniture and other valuable objects.